Nerd. Hanger-on. Thief. These are all words we think of when we’re brought into contact with the nefarious Captain Toad. This week’s ‘Shop Contest is all about showing all the awful deeds that the so-called “Captain” has accomplished in his long, evil career. Captain Toad has been going places and stealing gems and other precious objects since 2014, but there is no full accounting of his crimes. While he is tracking treasure in pursuit of some sort of noble goal (at least for him), it is undeniable that these gems and precious objects belong in the ground at best (and in a museum at worst). They don’t belong in the pockets of a puzzle-solving, head-stomping toadstool explorer. 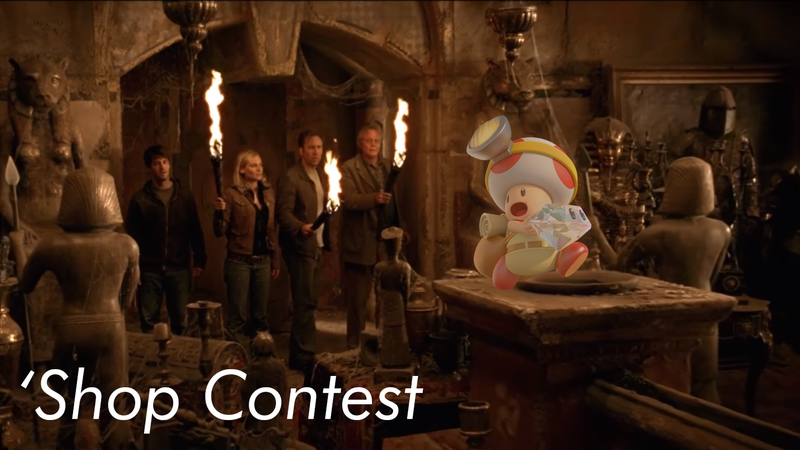 This week’s ‘Shop Contest is about exposing all of Captain Toad’s crimes. Is he ganging up with Sly Cooper to rob from the state? Is he competing with Nathan Drake again? Is there a reason he is always in the depths of King Koopa’s castles waiting for Mario? This is a contest about Toad and crime. Make it count. For your convenience, I have created a .PNG of the most nefarious Toad that I have used above. There are also lots of other pieces of character art of Toad that you can find out in the world.